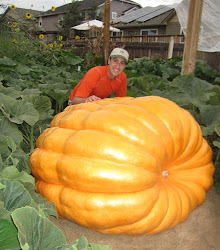 Last year, at the end of the season, I gave my pumpkin an extra dose of potassium and water just before the weigh-off. That is a risky move because it is a good way to make your pumpkin split, but it was calculated. Today, after an inch of rain I gave Stanley 3 ounces of fish & seaweed sprayed mostly on the ground. There is more rain in the forecast for tomorrow. The pumpkin grew slow during the three previous hot days and and since the pumpkin is split I figured I have little to lose with a number of cool days in the forecast ahead. I might learn a thing or two from this for future growing seasons of what to do or what not to do.